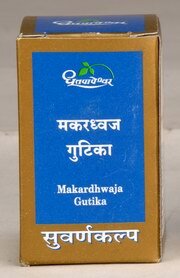 A time tested aphrodisiac with purest Svarna bhasma, it nourishes all Dhatus as well as Ojas. It is useful in the conditions, which arise due to Chronic Disorders and Mental Fatigue. As being a potent Aphrodisiac, it increases Vigour and Vitality. Poornachandorya Makardhwaja, Karpoora (Bhimseni), Jatiphala, Maricha, Lavanga, Kastoorilatika, Svarna Bhasma, Nagavalli. Infertility, chronic disorders fatigue, tuberculosis, general debility etc. One tablet once or twice a day preferably with cow’s milk, honey, butter, cow hee or betel leaf juice. Explore more Shree Dhootapapeshwar Ltd. products. This product was added to our catalog on Friday 15 June, 2012.